This natural cancer treatment is toxic to cancer cells, safe for you! When you're battling cancer, you want to stack all the cards in your favour - and that's why this natural cancer treatment is gaining a lot of support in the field of medicine. 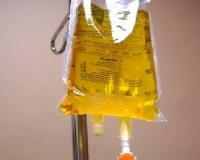 It's called IVC, and it stands for Intravenous Vitamin C treatment. Vitamin C is one of the most powerful antioxidants there is. But taking vitamin C orally as a supplement doesn't offer the same benefits as intravenous treatment because it stays in your body for longer (four hours as opposed to two) and it can be delivered to cell in much higher dosages. By injecting high doses of vitamin C directly into your bloodstream, it's been shown to deactivate cancer cells, and improve the quality of life of cancer patients. Futhermore, studies have shown that IVC is safe in high doses, except for people with kidney problems and a G6PD deficiency - which is a blood condition in which red blood cells breakdown as a result of certain medications. Other studies have shown that IVC administered in combination with chemo and radiation, yielded improved results for participants compared to those who didn't have the IVC treatment. They also showed that IVC reduced the side-effetcs of chemo and radiation. Keep reading to find out how IVC weakens and kills cancer cells. Cancer cells' mitochondria, which are responsible for energy and respiration in cells, produce abnormally high levels of redox active iron molecules. These molecules react with vitamin C and form hydrogen peroxide - a type of bleach that damages the cancer cells' DNA, weakening them and eventually causing them to die. If you are suffering with cancer, or know someone who is, ask your doctor about IVC treatment. Integrative Medicine doctors are your best bet when it comes to exploring all available treatment options, not just those in outdated medical text books.